Since its creation by Harry Beck in 1933, the London Underground map has become an icon of graphic design, and an invaluable aide to millions of London commuters. But who knew it also contained hidden symbols? Paul Middlewick knew. 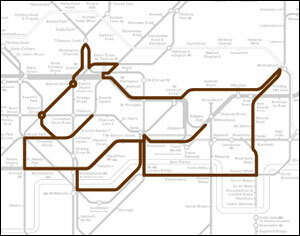 Seventeen years ago, he spotted the outline of a cartoon elephant amid the lines of the Underground Map. Several more animals have been found since, and they're all collected on a sweet little website called Animals on the Underground.